Briouats are small Moroccan pastries which are stuffed with a variety of fillings and then fried. 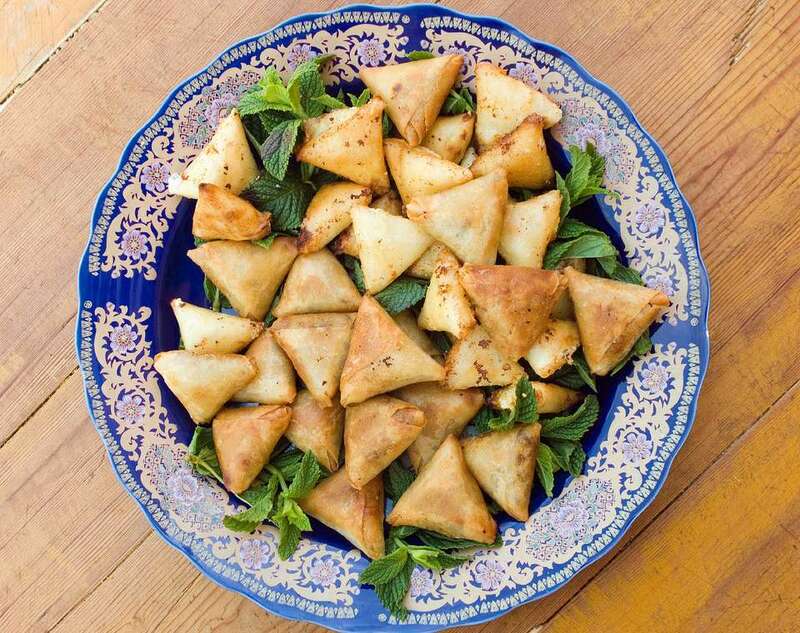 This recipe features ground meat (kefta, kofta or kufta) enclosed in crisp, paper-thin Moroccan pastry called warqa. Phyllo (fillo) dough or spring roll wrappers can be substituted for the warqa. Kefta briouats are usually served as a finger food or appetizer, but they can also be served as an entrée. This filling is mildly seasoned. Also try Spicy Kefta Briouats. How to Fold Briouats will show you how to enclose the kefta in the pastry and fold the briouats into triangles. Mix the ground meat with the onion and spices. Melt the butter in a large skillet or frying pan and add the ground meat. Cook over medium heat, stirring to break up the meat into fine pieces until the meat is well browned and thoroughly cooked. Stir in the parsley and the three eggs, and cook over medium-high heat just until the liquids are absorbed. You should be able to pack and mold the meat. Set the kefta filling aside. Fold the briouats. See How to Fold Briouats. With scissors, cut the pastry dough into strips about two-and-a-half inches wide. Place a single strip of warqa or spring roll wrapper – or two layered strips of phyllo dough – on your work surface. (If the strip of warqa is less than 10 inches long, use two layers.) Lightly brush butter on the bottom two-thirds of the dough. Place a large tablespoon of filling towards the bottom of the strip, and fold the bottom up to enclose the filling. Fold the bottom left corner of the enclosed dough upwards to the right, aligning it with the right edge of the strip. Then flip the bottom right corner upwards to the left, aligning it with the left edge of the dough. You should see a triangle take shape. Continue folding the triangle, flipping right and then left in this manner, until you reach the end of the dough. Trim any excess length off the edge of the dough, dab it with a little egg yolk, and tuck the end of the dough into the "pocket" formed by the open edge of dough on the briouat. You can use the tip of a butter knife or your scissors to help tuck in the flap of dough. Cook or freeze the briouats. Deep fry the briouats in hot oil until light golden brown. Drain and serve. Briouats stay warm for a long time, but if frying them well in advance of serving, you can reheat them in a 350 degree F oven for five to 10 minutes. Note: Uncooked briouats can be refrigerated for one day or frozen for up to two months in a freezer bag or plastic storage container. They can be fried directly from the freezer, or allowed to thaw for 30 minutes to one hour before frying.